Chris Wetzel says he thinks about the worst mass shooting in modern U.S. history probably every 10 to 20 minutes. "It's always on my mind. 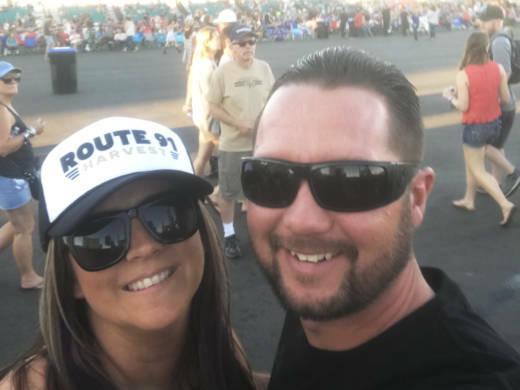 It never goes away," said Wetzel, a 39-year-old firefighter who works out of Cal Fire's San Luis Obispo unit, in an interview about the one-year anniversary of the shooting at the Route 91 Harvest Festival in Las Vegas. A gunman that night shot and killed 58 people -- many of whom were from California. Wetzel was at the concert with his wife and a group of friends, celebrating his birthday. "When this first happened all I saw was the sight of death and injuries and people grieving," Wetzel said. After the second round of bullets rained down on concertgoers at the Mandalay Bay Resort and Casino on Oct. 1, 2017, the Beaumont (Riverside County) man saw a woman who had been killed lying on the ground. Moments later he would lie on top of an injured man to protect him from getting hit again. After yet another round of gunfire, he tended to another victim, a man who was dazed and pale, stumbling around with blood pouring from his leg. That night one of Wetzel's friends, 35-year-old Hannah Ahlers, was shot and killed in the head. She left behind three kids and a community still in mourning. The months after the shooting were rough, Wetzel said. "I just wasn't feeling my job. Doing the firefighter thing, you're always used to helping someone. But when I was put in that situation that night, I didn't know if I wanted to do it anymore," Wetzel said. That changed after meeting with Zack Mesker, one of the wounded men he helped that night. Mesker, of San Marcos, has had several surgeries since the shooting. "Reconnecting with Zack, it gave me motivation to go back and love my job again," Wetzel said. He went on to help battle the massive Thomas Fire in Santa Barbara and Ventura counties and the resulting mudslides in Montecito. In the days after the Vegas shooting, Wetzel told KQED that he believed the country would get through the tragedy. "Maybe it will bring us closer together. I know a lot of bad stuff is going on, but we're better than that," he said then. Asked if he still feels that way, he says he's not sure. "There's been other shootings since that time," Wetzel said. "Sometimes I think people have already forgotten, which is kind of sad," he said.